Note: This is the second article of a four-part series covering green-building plastics (1) trends, (2) material advances, (3) process technologies and (4) applications. "Green building" is being transformed from a buzzword to a sophisticated approach using technology that redefines how we make and live in buildings that both reduce building energy consumption and provide for building energy production. This innovative technology helps to create a new market and value network, according to recent Plastics Institute of America market trend analysis. They "disrupt" an existing market by displacing earlier technology. This is particularly true in the evolution of green building material solutions. Void-forming lightweight concrete is an emerging green building material technology to watch. The Cobiax concrete flooring system uses void-forming technology developed by Swiss-based Cobiax Technology AG to remove nonworking dead load in a concrete slab by up to 35 percent, compared to a solid slab of the same bearing capacity while maintaining biaxial strength. The void formers, used for multiresidential, commercial and industrial applications, displace concrete that has no structural benefit to allow optimization of concrete slab thickness and building material volume. The void formers are blow-molded plastic spheres in various sizes made of 100 percent postindustrial recycled HDPE (high-density polyethylene) and PP (polypropylene). 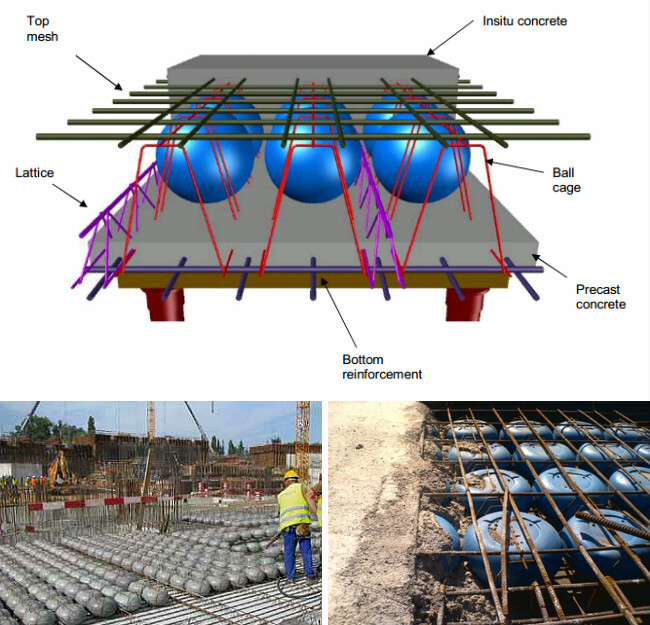 To simplify handling of void formers and facilitate construction, the plastic spheres are supplied as void modules contained in reinforced steel cages prepared onsite. Cobiax Technology AG Void former design (top), onsite layout (left) and finishing concrete slab (right). Weight reduction — the dead-load reduction created by the void formers is in a range of 1.4 and 4.8 kN/m² (kilo Newtons per square meter) depending on their size, providing concrete slabs up to 35 percent lighter than solid flat slabs with up to 15 percent less load acting on the foundations. The reduced weight allows greater freedom for structural design. Large spans — spans of up to 20 meters are possible, with up to 40 percent fewer columns, and flat soffits with no obstructing beams. Earthquake safety — reduction of the accelerated mass and reduced damage risks. 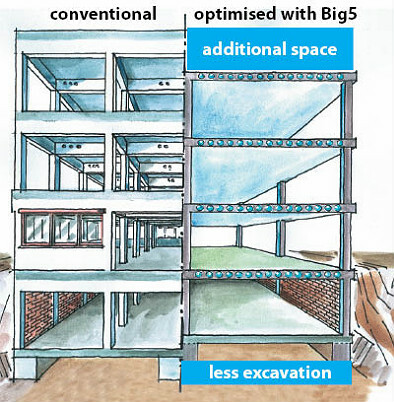 Cost effectiveness — reduced floor-to-floor height and concrete/reinforced steel savings. Sustainability — resource efficiency through building materials savings, use of 100 percent recycled HDPE and PP in blow-molded plastic void formers, and CO2 emission reductions through concrete volume optimization. Cobiax Technology AG Conventional building height/space (left) and void former optimized height/space (right). The Elbphilharmonie symphony concert hall in Hamburg, Germany (scheduled to be completed in 2016) is making use of various types of Cobiax modules in the building’s concrete slabs. In addition to the reduced amount of concrete/steel needed, 90 tons of CO2 emissions have been avoided by using Cobiax. Long-glass fiber-reinforced thermoplastic concrete forms are entering the green building market place. In an industry first, long-glass fiber-reinforced thermoplastic is being used to injection-mold concrete forms. The thermoplastic forms were developed by Sabic Innovative Plastics and Meccano de Mexico, a Mexican construction supply company. Using 30 percent glass-filled LNP engineered nylon Verton compounds, the one-piece forms are molded on horizontal presses. The injection-molded forms measuring up to 3.7-by-2 feet are produced in presses of 2,000 and 2,500 tons clamp force. The forms replace heavy traditional multipiece steel forms. The fabrication of traditional metal forms requires assembly of as many as 30 different components and can take up to three hours to assemble. Eliminating the need for assembly with a one-piece design allows the forms to be ready in just minutes. On average, 500 concrete panels are required for a typical row house in Mexico. The lighter weight forms can be transported and maneuvered on site more easily. The forms are 20 percent lighter than aluminum ones and 40 percent lighter than carbon steel. Meccano de Mexico Concrete forms molded of thermoplastic composite (left) and concrete wall sections made using long glass thermoplastic forms (right). High-performance green building roofing systems are coming of age. A high-performance roof system combines white single-ply EPDM (ethylene propylene diamine) membrane with polyurethane insulating technology. BASF and Carlisle SynTec are partnering on the high-performance roof combining Carlisle's Sure-White FleeceBACK single-ply EPDM membrane with BASF's polyurethane insulating technology. The roofing components work together to create a monolithic, seamless blanket of waterproof insulation that acts as an air barrier and eliminates thermal bridging. The composite system is also resistant to wind uplift (80 mph wind speed coverage), hail (up to 3-inch hail) and accidental puncture. The roofing is well suited for recovering aged gravel built-up roof (BUR) or other asphalt-based roofing systems. Polyurethane foam insulation — SPF-245 polyurethane foam based on BASF technology — is spray-applied to the prepared gravel BUR surface. Insulating adhesive is then applied to bond the insulation and polyester fleece backing which has been laminated to the EPDM membrane. Carlisle’s unique FAST Adhesive provides a mechanical bond between the polyester fleece backing and the sprayed polyurethane insulation. 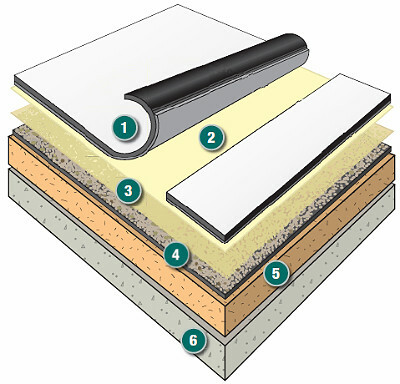 Carlisle SynTec Typical roof recover cross-section: (1) FleeceBACK 100-, 115- or 145-millimeter membrane with factory-applied tape; (2) insulating FAST Adhesive; (3) SPF-245 insulation (BASF spray polyurethane foam); (4) gravel BUR surface; (5) existing insulation and (6) existing roof deck. Fiber-reinforced thermoset plastic rebar is pursuing metal-to-plastic green building conversions. Composite rebar is a quarter of the weight of comparably performing steel. The higher strength-to-weight ratio can provide greater carrying capacity for a given structure or provide opportunities to reduce the size and weight of an entire structure. Additionally, more rebar can be hauled per truckload without exceeding legal loading limits and the lighter rebar weight facilitates handling by construction workers. The tensile strength of fiber-reinforced plastic (FRP) rebar is typically 1.5 to 2 times higher than steel, so it’s a good counterbalance to concrete's high compressive strength. It also provides excellent fatigue resistance, making it suitable for cyclic loading situations (such as those on bridges and roads). Composite rebar won’t rust or corrode, making it ideal for certain applications such as swimming pools, aquariums, retaining walls, piers and canals. It's also immune to road salt and other deicing chemicals, making it a more durable and less maintenance-intensive choice for parking structures, roadways/bridges and airport runways. Although the initial cost of composite rebar is generally higher than standard steel rebar and is roughly comparable to epoxy-coated steel rebar, when considered on a lifecycle cost basis, it can be quite economical. "HollowRebar" offers tensile strength advantages over comparable solid metal rebar due to the elimination of the nonefficient core. Tensile strength test comparisons show values in excess of 160 ksi (kilopound/inch2) for HollowRebar, compared to specifications for roughly weight-comparable #4 solid composite rebar (a 0.50 inch diameter, 0.20 inch2 cross-sectional area) at 100 ksi, and 60 ksi for steel rebar. Composite Rebar Technologies Inc. is the exclusive license holder of this FRP composite HollowRebar technology, developed at Oregon State University. The rebar features a hollow pultruded inner layer of vinyl ester resin containing continuous glass-fiber reinforcement. This inner layer does the work of carrying the loads. The hollow, continuously reinforced rod is covered with a discontinuously reinforced BMC (bulk molding compound) sleeve. Bonded to the bar during the continuous production process, and depending on the application, this outer sleeve can be reinforced with chopped carbon, glass and/or basalt fibers. The outer sleeve protects the inner layer from impact damage during storage, transport and installation; acts as a barrier layer to protect the bar from microcracking and provides surface texturing options. Protecting the bar against microcracking/moisture intrusion is necessary since concrete's alkalinity can degrade glass. Texturing options such as helical deformations increase bonding to concrete. The hollow core can also serve as conduit for electrical wiring or fiberoptic cable, enabling data or voice transmission, or it can house smart sensors for structural health monitoring. Composite Rebar Technologies Composite HollowRebar (left) and pultruded composite stock (right). Which is the most important green building plastic material trend?